Software giant Microsoft (MSFT) is expected to show off a new line of mobile phones Monday that will be loaded with its software, MarketWatch.com reported. 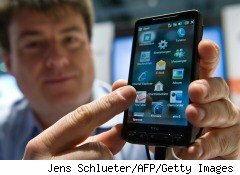 The phones will feature touch screens and run on the Verizon Wireless network, according to the report. Technology watchers have long expected Redmond, Washington-based Microsoft to challenge phones by Apple (AAPL) and Google (GOOG) with its own smartphone tailored to work with its software, according to the report. Microsoft has for years made software to run mobile phones but has relied on partners to design, deliver and market the hardware, MarketWatch says. Sharp is expected to manufacture the new Windows phones, the report says. For the full story, see Microsoft seen unveiling mobile phones.